They say "April showers bring May flowers", but in the culinary world, April showers are a reminder that the beautiful flavors of spring herbs and fresh vegetables are on their way. And, these wonderful ingredients come just in time to help us create recipes that celebrate a famous holiday - Cinco de Mayo! I think most Americans celebrate Cinco de Mayo for the simple reason to enjoy margaritas and sangria while they eat delicious Mexican "style" dishes. However, there is a very interesting story that comes with the celebration of Cinco de Mayo. In fact, if most people knew the real story they would have several other dates to celebrate too! Now many people believe that the significance of Cinco de Mayo is related to the independence of Mexico, but this is not correct. The real story is that on May 5th, 1862, 4,000 less trained Mexican troops defeated a highly trained French army of 6,000 thus, the reason for the celebration. However, history will carefully explain that their victory celebration on May 5th, 1862 was short lived. Mexico’s independence from the Spaniards did not come until 5 years and 1 month later on June 5th, 1867. In my struggle to create a familiar Mexican “Style” recipe, I have chosen to bring you my own version of chicken fajitas with a semi-authentic twist: Mexican Inspired Grilled Chicken Fajita Bundles over “Gringo” Red Cabbage Salsa! I prepared my poblano, red and yellow peppers, tomatoes and onions in an authentic Mexican fashion, then added some seasonal touches by incorporating fresh purple cabbage, garlic, and cilantro to my final product. The final touch was to melt smoked Gouda cheese on my flour tortillas. The crispy texture of the tortillas was pure perfection and I really believe my ElectriChef grill helped to achieve the final flavor profile in this recipe! The ability to change the temperature of the grill quickly helped to char the peppers, tomatoes (high heat) and flour tortillas (low heat). 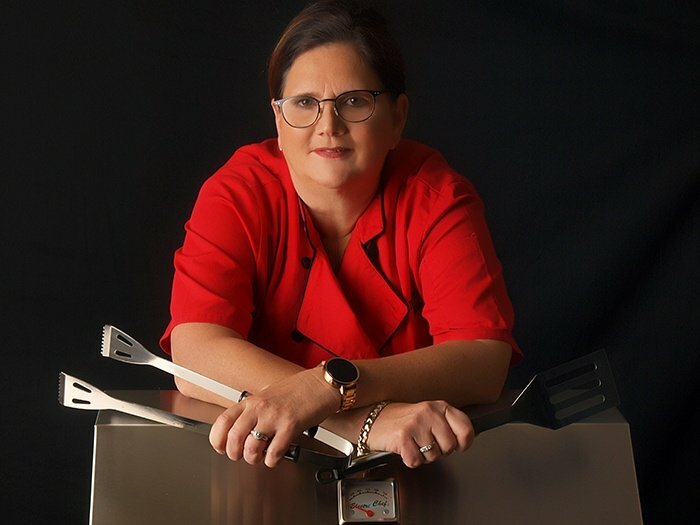 Within minutes I could adjust my grill to maximize flavor, prepare my meal, and enhance my recipe! NOTE: 19 ingredients seem like a lot, but most ingredients are necessary to build the complex flavors of a Mexican meal. For time-saving methods, you can buy green chili and fresh salsa and cut back on many ingredients. Remove chicken breasts from package and place on a cutting board covered with parchment paper and set aside until chicken is room temperature. 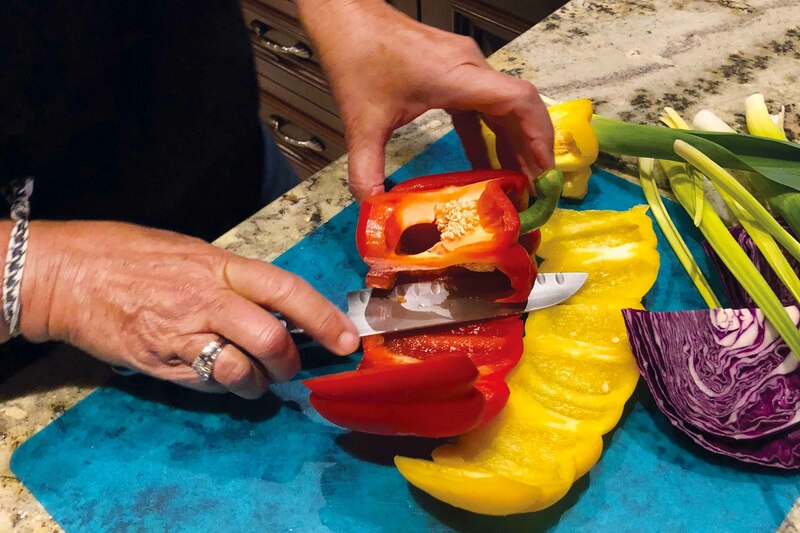 Use a separate cutting board to cut peppers in a long strip as shown in the photo and set aside. CHEF TIP: It is a timesaver to cut the peppers in one long strip because you can turn the entire pepper in one motion when it’s on the grill. Place the strips cut from the leek into a glass bowl with water. Then place in the microwave for 2 1/2 minutes and blanch leeks until they are soft. 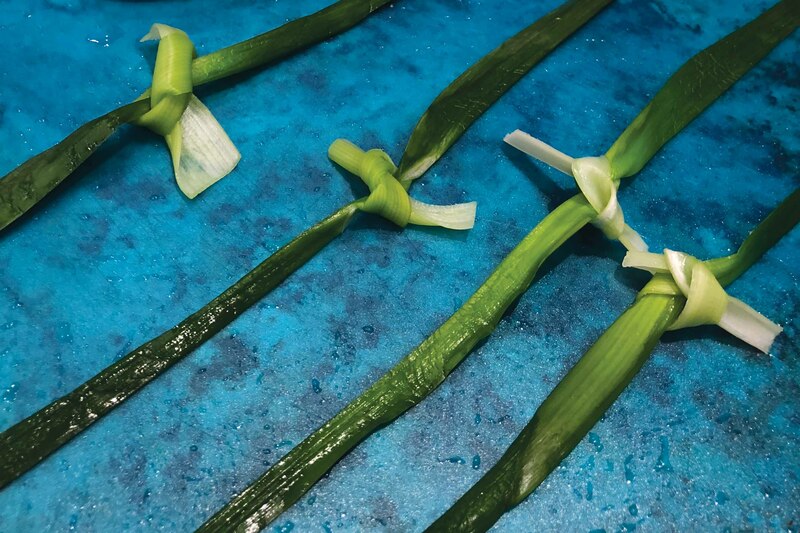 Tie leek strips together so you can tie your chicken bundles. Spray your ElectriChef grill grates with Canola oil. Then preheat your Electric Grill to 450°F. While the grill is preheating, place the peppers, including the two poblanos and the onions on the grill for about 3-4 minutes. Cut the red cabbage into two wedges and dip the wedges in water just prior to placing on the grill. The additional moisture will help the cabbage to begin to steam while the grill is preheating. Season the chicken on both sides with 1/2 of the lime zest and juice, dried mint, fajita seasoning and salt and pepper. Turn the vegetables on the grill one time for an additional 2-3 minutes then remove the peppers, onions and red cabbage to a clean cutting board. 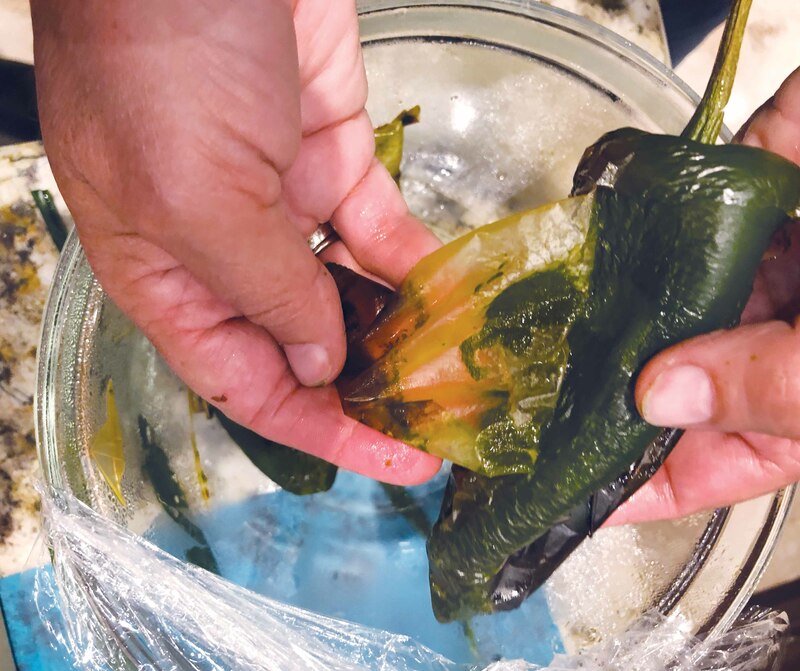 Place the poblano peppers into a glass bowl and cover with plastic wrap. This will help the peppers to steam and sweat, loosening up the skins, and making it easy to peel the poblano peppers. Once poblano peppers are peeled, remove the tops and seeds. Cut poblanos into strips and set aside. Slice onions and peppers into strips, reserving half for chicken bundles and the other half for the salsa. 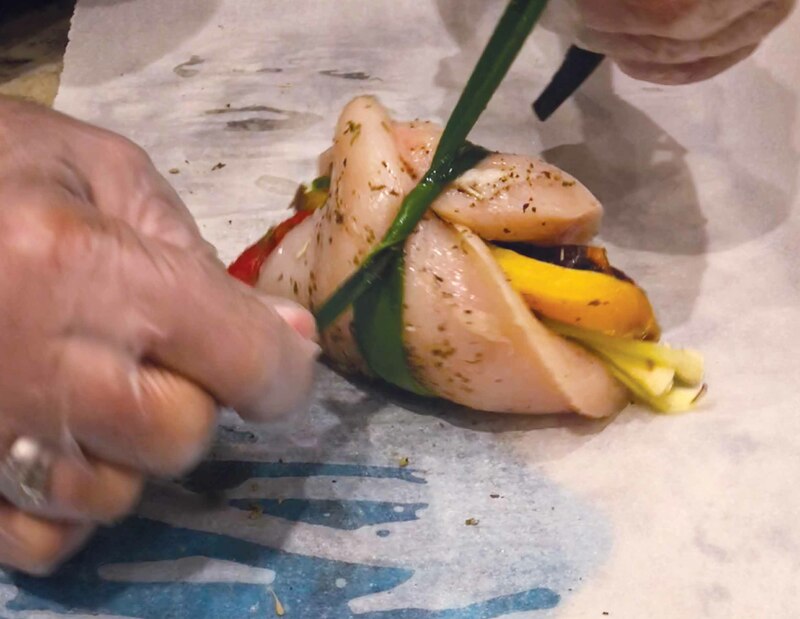 Place 4-5 pieces of the grilled red and yellow peppers and onions and tie chicken breast around vegetables with the strips of leeks forming a bundle. 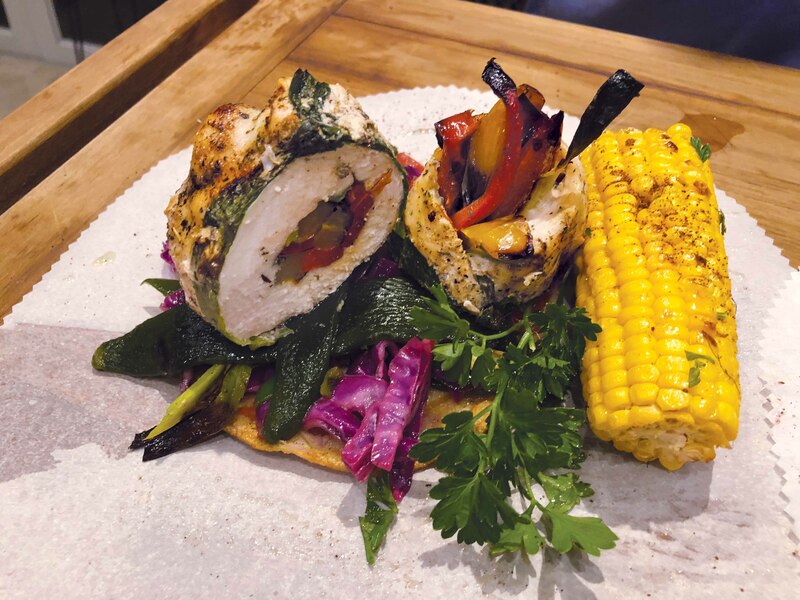 When all the chicken bundles are ready, place the bundles on the ElectriChef grill and cook on all sides until the internal temperature is 160°F, about 14-16 minutes depending on the thickness of the chicken. CHEF TIP: Make sure you use a thermometer to check the internal temperature because the chicken bundles are thick. It is necessary to turn the chicken bundles on all sides. Also, closing the ElectriChef grill lid will help the bundles to grill quicker. 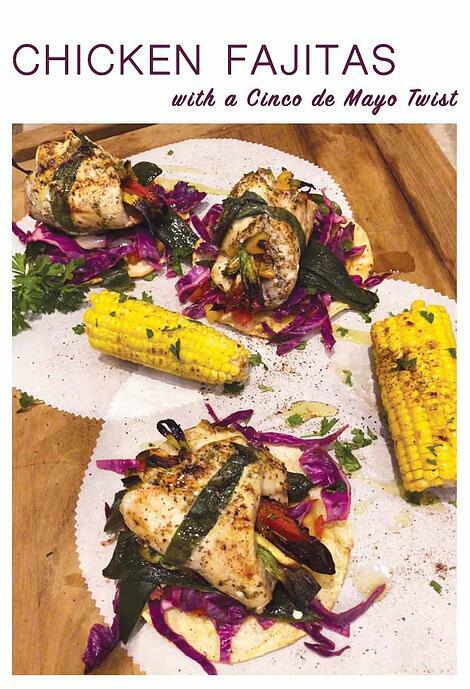 Remove the bundles from the grill and let rest for 2 minutes to allow internal temperature increase to 165°F. While the chicken bundles are grilling, shred the red cabbage and place in a medium bowl with the remaining lime zest and juice, fajita seasoning, dried mint, and leftover grilled onions, red and yellow peppers (all should be chopped from strips for the salsa). Reduce the temperature of the ElectriChef Grill to 300°F. Baste corn tortillas with olive oil and dash of chili powder and place tortillas on grill. Once one side is slightly charred, turn and place a slice of smoked Gouda on the tortilla, remove when cheese melts and tortilla is warmed. Place grilled tortillas on a clean cutting board and place poblano pepper on Gouda cheese, then add a portion of the “Gringo Salsa,” under the chicken bundle and garnish with chopped spring onions. Finalize by drizzling olive oil if you wish. Serve with grilled corn or black beans and rice. Now you are ready to have a wonderful Cinco de Mayo party with your friends and family! 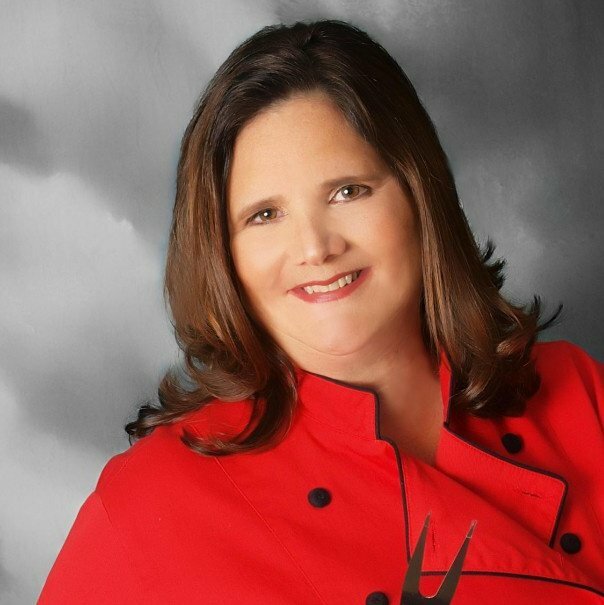 Be on the lookout next week for a delicious Mother’s Day brunch meal with a Hispanic flair as we explore how to make traditional sauce called “molli”.